I follow THE_REAL_SHAQ on Twitter. He's one of the few celebrities I follow and I only follow him because of his fun Tweets. You can tell he loves Twitter. 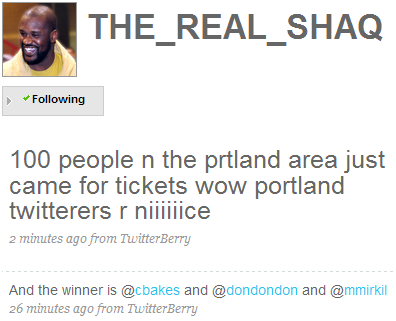 I often see Shaq giving away tickets to his games via Twitter. Here's the Tweet from Shaquille O'Neal moments ago. Pretty cool, eh? We're one degree of separation from Shaq. Soon thereafter, Shaq updated us. I forgive him for the typos. He's working the Blackberry with the fingers of a seven footer. here's a better use of your time! help save the great bear rain forest! That reminds me, I have to get my chainsaw out of winter storage. How is saving the great bear rain forest more important than hearing from THE_REAL_SHAQ? Heard about this story the other day on Around The Horn, pretty cool, I think he also left tickets at will call for "Twitter". I've never been a huge Shaq fan by any means, and acknowledge that he seems pretty funny, but how he's connecting with fans like this is pretty damn cool. I saw that earlier today. 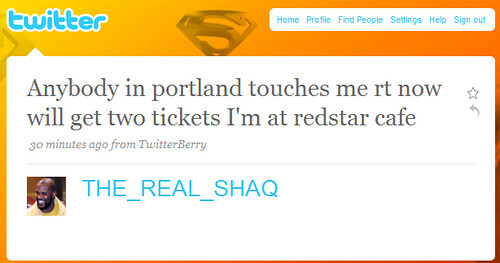 It's nice to see Shaq does his own tweeting. Nice quote in there from Shaq regarding the need for some stars to hire ghost writers to compose 130 character prose.